In late July, UC Berkeley fire ecologist Scott Stephens was working in Stanislaus National Forest, gathering data on how a century had altered its character. What he saw were the signs of a clear and present danger. "The thing that was startling was that there was more change than I ever would have imagined," recalls Stephens, a professor of fire science who devotes much of his time to field research. "I remember thinking, 'Boy, this place is really susceptible to high-severity fire.'" On Aug. 17 the Rim Fire ignited, changing the forest far more, and in far less time, than anyone could have imagined. The blaze scorched hundreds of square miles—roughly a quarter-million acres—in the Stanislaus, and thousands of acres in neighboring Yosemite National Park. It left what has been described as a moonscape, in the process killing wildlife, destroying habitat and – as he discovered when he returned in September – reducing his 400-odd research plots to embers. Stephens had left the area by the time the fire erupted, but four of his Berkeley undergrads—summer technicians supervised by a member of his research team—were still taking readings a few miles from ground zero. They were in regular contact with the U.S. Forest Service's district office, he says, and "realized in a hurry they had to leave." The Rim Fire, to Stephens' distress, confirms the most urgent finding from decades of research. As he and his co-authors wrote in a paper published this month in Science, "Fire policy that focuses on suppression only delays the inevitable, promising more dangerous and destructive future fires." "We know that taking fire out of ecosystems is a big deal in places like mixed-conifer forests, which used to burn every decade or so," he says. Then, in 1905, the Forest Service was established – not coincidentally, the year the last fire occurred in the area Stephens was studying. It wasn't long before the agency began implementing its so-called 10 o'clock policy, which called for extinguishing every fire by 10 a.m. the morning after it was discovered. But by clearing out understory, those smaller, low-intensity fires once acted as natural firebreaks against larger, more damaging fires. Acording to survey data, Stephens says, a section of one of his research plots had 19 trees per acre larger than six inches in diameter in 1911. When he and his students were there in July, they found 260 such trees per acre, "an astonishing difference." Even as density has increased, though, the average diameter has dwindled as younger trees fill in the spaces between older, bigger ones. And the amount of dead and downed material on the forest floor has quadrupled or even quintupled, Stephens says, to perhaps 40 tons per acre. That adds up to an unprecedented "continuity of fuel," he says, enough to feed a raging inferno fierce enough to destroy the imposing, old-growth Douglas fir and ponderosa pine trees beloved by visitors to Stanislaus and Yosemite. 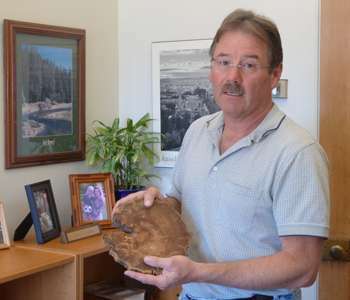 "A lot of places in the Sierra Nevada have been harvested so thoroughly, the big old trees are gone," says Stephens, who grew up in a lumber-mill family. "But this place was different. It still had trees that were three-and-a-half, four feet in diameter. These are trees that are 300 years old, easy. "So I was standing there thinking, 'My goodness, here are these trees that are really important, we don't have them in all national forestlands, and they're vulnerable. And then we went back, and every one of those trees was dead. And it wasn't just that area. It was miles. Miles and miles of dead trees. It was really kind of sad." "I was really a forest person in a big way when I was a young kid," says Stephens, though not, perhaps, in quite the way he is now. Both of his parents worked at Humboldt County's Pacific Lumber Co., as did his grandfather and three of his uncles, before the company fell victim to a notorious hostile takeover in 1986. "It was so close to me that I never saw it as all that special," he says. He earned his undergraduate degree, in fact, in electrical engineering, worked as an engineer for the U.S. Department of Defense and lectured at Sacramento State, his alma mater, for a number of years. He'd just begun Ph.D. work in electrical engineering at UC Davis when he was introduced to the realm of natural sciences and "knew it was in my heart to follow it." "I liked electrical engineering," he explains, "but I just didn't love it." "That's the fun part," says Stephens, who acknowledges it can sometimes be intense as well. "Every fire you're on you learn from, because they're always a little different – the wind changes a little bit, the weather changes a little bit, the fuel changes, the topography's different. So every one is a learning exercise." The good news, he says, is that more and more land managers appreciate the vital role natural fires and controlled burns can play in preventing future Rim Fires. The bad news: Population growth in and around national forestlands, combined with budget constraints on both federal and state agencies, greatly complicates the task of adapting management policies to forests' need for smaller, more frequent, less destructive fires. The National Park Service has recognized this for decades – which helps to explain why the Rim Fire wreaked most of its destruction outside Yosemite's borders – and even the Forest Service has recently seen the light, Stephens says. But the agency has been hampered by the need to protect homes and structures, which means putting fires out instead of letting them burn. "People living in the urban interface have really changed the whole fire dynamic," Stephens explains, "because now, when a fire starts, if it's near anyplace that's got people, all of the engines go to structure support. They try to defend houses, they cut shrubs around them, they burn out away from them and they basically put fires out that are coming in. "Structure protection costs a fortune," he adds. The nation's fire-suppression budget has soared from around $300 million in 1995 to $2 billion today, an increase Stephens attributes in large part to persistent building in forested areas – including those where fires have occurred. "Unless there's some way to link the real costs associated with that," he says, "I see no reason to change." As long as the U.S. government keeps subsidizing fire management in the urban interface – where it has no authority to restrict private building—federal agencies won't have the resources to ensure more sustainable forest ecosystems, Stephens says. He and his Science co-authors suggest making the states responsible for the costs of firefighting in the urban interface. The recommendation, which would require an act of Congress, is "heartburn city for California," he admits, and won't be popular with other budget-strapped states, either. "I'm just trying to figure out a way work can get done on these lands," Stephens says. "I think we have a decade to really change course." "I do think that we know enough," he says, to make critical policy changes. "The science is getting more and more clear. The vulnerabilities are very clear. So I am optimistic that things could change. I'm optimistic that Congress could engage at some time, and really make a difference. When it's going to happen, I don't know." To Stephens, though, failure to act isn't an option: "I think the stakes are so high that, for me, it's almost unimaginable that we don't change course."